The salad days are here again. Now is the time to take advantage of all the fresh new growth bursting with the sun's energy. If you're in California, the salad days have been on for a while; in the Great Lakes region you're just off the block. Wherever you are, enjoy those early greens. They were important—sometimes life-saving—for our ancestors and should be just as revered by modern Homo sapiens. Want to commit a radical act? 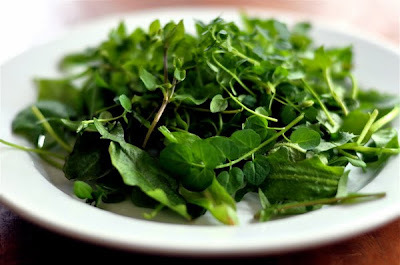 Step outside your back door and pick some weeds for the table. That's a metaphorical rock through the window of Big Ag and a first step toward putting our hopelessly effed-up food system on notice. As I've mentioned in numerous posts, many of the weeds we spend countless hours and dollars trying to eradicate are actually more nutritious than the stuff we grow on purpose. Think wild, think local, think seasonal. Think for yourself. You don't need some massive head of corporate-sanctioned lettuce from the supermarket to get your greens on. Today's salad includes a mesclun-like mix of tender young greens: Dandelion, cat's-ear, chickweed, and bittercress. The rest is miner's lettuce, a native plant in my region. All are tasty and nutritious. I've been out there foraging and ate a bunch of mustard greens with Easter dinner. We froze enough to last through the summer. Looking forward to salad days here, too, Lang. We're some weeks behind you! We've been enjoying dandelions and garlic mustard mixed in with out homegrown greens. We've been eating Wild Weeds and Rice and Wild Green Salad almost everyday for the past several weeks! Thank you for the inspiration! And thank you for the photo's - they look great!